On the day the federal government accused disgruntled politicians of sponsoring the separatist group, IPOB, the All Progressives Congress, APC, in Ekiti State has accused the state governor, Ayodele Fayose, of funding the group and its leader, Nnamdi Kanu. The party accused Mr. Fayose, a vocal critic of the Muhammadu Buhari federal administration, of plotting to destabilise Nigeria. The party also said that the governor’s counsel in a press release on Saturday urging dialogue to resolve the Biafran crisis was an afterthought. The Publicity Secretary of the party in the state, Taiwo Olatunbosun, said in a statement on Sunday that the Nigerian Army was performing its constitutional role of preserving the unity of Nigeria and bringing all secessionists and their backers to justice. Mr. Fayose had urged the federal government to embrace dialogue in the resolution of the Biafran agitation after the Nigerian military declared IPOB a terrorist organisation. He had earlier accused the government and the military of ethnic cleansing in their handling of the Biafran agitation. “On April 26 and as published by The Nigerian Tribune Newspaper and its online publication on April 27, 2017, Fayose said he was working in conjunction with Deputy Senate President, Ike Ekweremadu, to raise funds for Kanu, stressing that he was taking his support for Kanu beyond showing solidarity in court by raising funds that would be deposited in an account opened in Kanu’s name,” Mr. Olatunbosun alleged. He quoted the governor as saying that, “as many lawyers willing to fight the oppression should join the struggle for liberation from the oppression,” alleging that Mr. Fayose was not new to seditious and treasonable activities to bring Nigeria down. “He led a campaign to the Chinese Embassy in Abuja and later to Shanghai, the Chinese capital, to urge the Chinese government not to lend hands in helping Nigeria out of recession,” continued Mr. Olatunbosun. “Relentlessly, he led hate campaigns against the symbol of the Nigerian authority, President Muhammadu Buhari, wishing him dead, including hounding and haunting the President across the world, including on his sick bed, and threatening to expose the President on a life-support machine, all these in spite of swearing to uphold the Constitution of the Federal Republic of Nigeria and to be loyal to the Nigerian state and her President. “He went further as reported in the media on May 25, 2017 that ‘Ekiti State is now part of Biafra’, which drew the ire of several Yoruba groups as reported in the media. 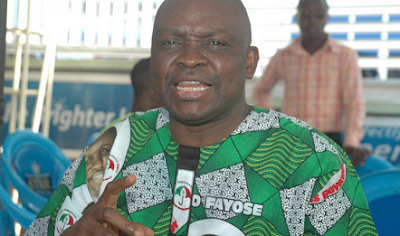 Mr. Olatunbosun further alleged that Mr. Fayose demonstrated the seriousness of his support for the collapse of Nigeria when he released his telephone number 070300000393 and email: [email protected] as reported in the media on April 27, 2017, urging all that were interested in the Biafra cause to contact him through the phone number and email address. “All the South-east governors, including the Deputy Senate President Ike Ekweremadu, have opposed Kanu in his secessionist activities while Governor Nyesom Wike of Rivers State has warned Kanu and IPOB to stay away from Rivers; but Fayose declared Ekiti State as part of Biafra and that has confirmed the report that he is part of Biafra’s financiers as he had publicly declared to the media,” said Mr. Olatunbosun. “No wonder, just four months after Fayose started mobilising funds for Biafra, thousands of deadly weapons, including military assault rifles, were smuggled into the country but were intercepted by the Nigerian Customs while it was also discovered that uniformed Biafran militants already have military training camps where they are planning deadly assaults against Nigeria after threatening her leaders. “We had earlier alerted the security agencies to the presence of armed gangs and stockpiling of arms in the Ekiti State Government House and his present activities in raising funds for Kanu only confirm that he is part of rebellion against the Nigerian state. The APC spokesman urged security agencies and Interpol to investigate Mr. Fayose in his support for funding IPOB with “the latest influx of military assault rifles into the country.